My thanks, yet again, to Futurist Foresight for providing the link to this fascinating infographic, which is the work of the good people at Envisioning Technology. 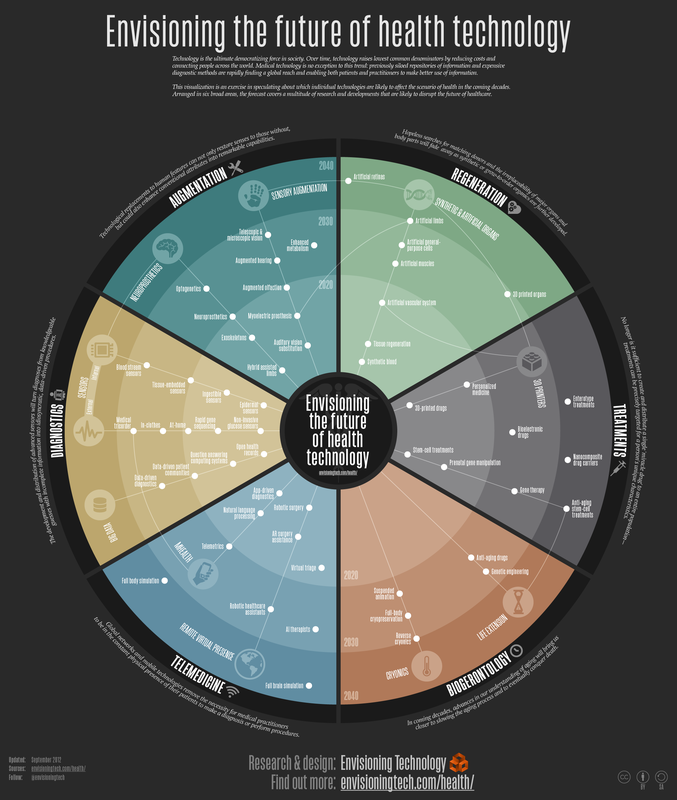 People may remember this website from their work on “Envisioning Emerging Technology”, an infographic from a previous article which addressed the likelihood of interrelated technological developments in the coming decades. As a trend forecasting studio, compiling information and predictions into reports and tables in pretty much what these guys do. What a cool job! In any case, here we have a table representing the future of health technology, as predicted by ET. Diving their findings into the fields of Augmentation, Biogerontology, Diagnostics, Telemedicine, Treatments, and Regeneration respectively, they attempt to show how small advancement in the near future will branch outwards to more radical ones in the not-too-distant future. The rough dates correspond to their previous graphic, starting with modern day research and culminating in 2040. Some inventions that are predicted include the Tricorder, 3D printed organs, artificial limbs, artificial eyes, cryogenic freezing, gene therapy, AI therapists, robotic nurses, robot surgery, implanted sensors, and exoskeletons. Wow, tricorders, really? In truth, I am often alarmed at what will be possible in the near future, but knowing that advancements are around the corner that could make life a lot healthier and happier for so many people gives me hope. Until next time! Love it! Thanks for sharing. All I can think about when I look at it is Ghost In The Shell and Minority Report. This is proper sci-fi brain candy. Did you check out the last one? It covers the future of technology in a more holistic way. No, I did not. I shall investigate! I haven’t had regular T.V. for a couple of years. Remember all those commercials where they would show people using items in development in real world situations. I remember the one with the medicalk ‘tricorde r’ like scanner. The other was voice activated home security. So you could unlock your door by talking to it when your arms are full of groceries. I always wondered what would happen if you had a cold that altered your voice. That’s happened to me before. There are a lot of things in the works right now. It will be interesting to see which things succeed and what ends up on the market.